Video 557 - Ashley eating bread (saying bread) and making funny faces. Video 558 - Ashley singing the Minions "Banana" song (baby version). Video 559 - Talk about ego-centric! Ashley steps on her cousin Victoria in an attempt to reach whatever it is she wants to reach. It's great how her older cousins and sisters understand she is just a baby and let her do as she wills. Stripey-sisters strike again! Riding a scooter inside a mall. I love it when babies cling to mommies' legs. So cute. We have sold our beloved Ergo baby carrier. Thanks for the great service! Bath crayon glasses and moustache for Natalie. The box of bath crayons show beautiful child-drawings of suns, flowers and butterflies. I got this. Glad the girls (Nat, Ol and Lauren) had fun creating this masterpiece with lots of shrieking and giggling. Ruthless Ashley -- stepping on others to get ahead. Getting cold - time for sleeping bag babies! DJ Ash in da house. 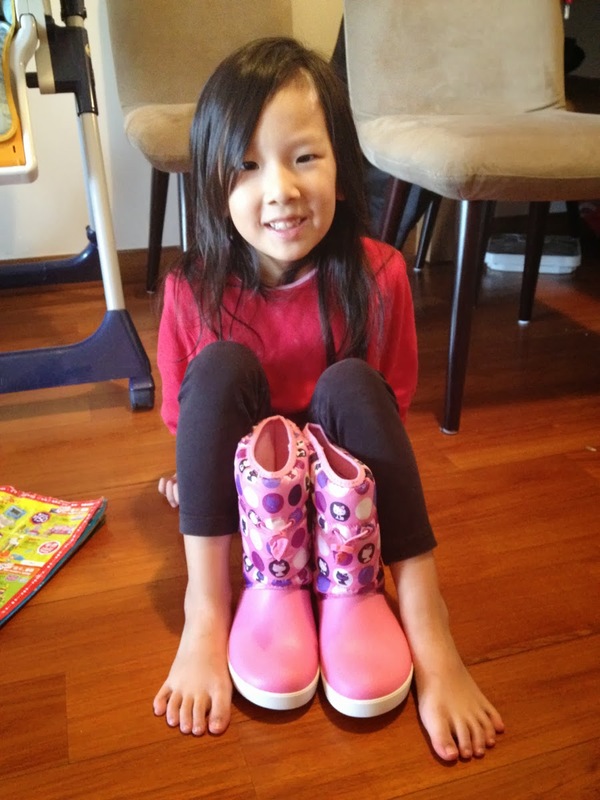 Thanks for the boots, Por-por and Gong-gong! Natalie has grown prettier with her age.